Jaw pain can range from mild and fleeting to chronic, intense, and disruptive discomfort that gets in the way of eating and speaking. Persistent jaw pain may be caused by TMD, or temporomandibular dysfunction, and its associated condition nighttime teeth grinding (bruxism). Dr. Veronica S. Walker, your dentist in Kernersville, treats both of these painful problems -- keep reading to find out how. The TMJ (temporomandibular joint) is at the base of your jaw and below your ear. It is a network of bones, ligaments, and nerves that helps your jaw open, close, and move from side to side. Normally, the joint can move without issue -- but when something is off with its alignment, you will likely feel it. 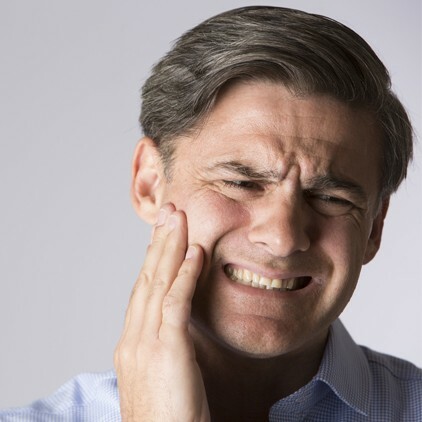 TMD (which is often simply called “TMJ”) is the dysfunction of this jaw joint, either due to an injury, stress, misaligned teeth, or another factor. Bruxism is unconscious teeth grinding and jaw clenching that often occurs at night. It is often associated with TMJ disorder. People who grind their teeth at night are more likely to exhibit weak or worn tooth enamel, which leaves the teeth at a higher risk of decay. Gum recession and loose or shifting teeth are also common with untreated bruxism. Seeking prompt treatment is important for continued oral and overall health. You can find an effective treatment for TMJ in Kernersville and/or bruxism by visiting your dentist. As an expert in everything related to your teeth and oral structures, Dr. Walker is especially well equipped to help you find relief from these chronic conditions. A custom-fitted mouthguard can help to protect the tooth enamel from the excessive pressure caused by grinding and jaw clenching during the night. A device that repositions your jaw can also reduce the occurrence of jaw clenching that causes the TMJ to ache during the day. Sometimes, the jaw may need to be adjusted to reach its optimal position. Orthodontic treatment may also be recommended to improve the alignment of the dentition and reduce teeth grinding and jaw clenching. No matter the treatment that serves your needs best, partnering with an expert will help you find the solution you seek -- for relief from jaw pain and teeth grinding sooner, rather than later. If you are suffering from persistent jaw pain and/or if you grind your teeth at night, Dr. Walker can help you identify the problem and find a fitting solution. Please don’t hesitate to schedule an appointment -- doing so is the first step to enjoying lasting relief!